This post features a collection of carefully selected resources for students learning within online environments; it’s geared to leaners and educators seeking resources for just-in-time learning for technical, academic and study skills required to learn efficiently and successfully in a for-credit or open online course. Students need a wide range of skills to learn successfully in online settings; they need to be tech savvy, know how to collaborate with peers, conduct online research, navigate proficiently within the learning management platform, manage their time effectively and engage in the learning process by interacting with content, peers and completing course work via the learning platform. Many high school and undergraduate students (perhaps even learners with an undergraduate degree or higher) have a skill gap in one area or another when beginning an online course for the first or even second time. It’s also likely a significant number of students lack the required academic skills for the online course they plan to complete. Research states that as many as 60% of entering college freshman do not have the math or writing skills required for college-level course work. It’s no wonder that some college-level students are not successful with online studies. Several students will fail, withdraw, or may not learn as deeply as they could have due to a lack of skills in one or more areas. Three Categories of Resources: The resources featured here address skill gaps in three areas: 1) technical, 2) academic and 3) study skills. The academic section includes resources for subject areas of writing composition, grammar and math. The technical section links to sites that provide instruction for learners in basic web skills including e-mail and file uploads, how-to navigate and search on the web, and it also features a list of resources for student support specific to learning management (LMS) platforms. The section on study skills provides a list of resources geared to learners studying online; skill development for time management, study planning and prioritizing. How to Help Students: I’ve compiled the following resources hoping it may help online learners, by readers sharing ideas and strategies for learning support as discussed here. To further support students, I also recommend institutions create an orientation program for new online students that introduces students to the LMS platform, the features specific to the course site, the syllabus, as well as the resources for academic and technical support. Another idea implemented already by several institutions is a learner readiness quiz, specific to online students. Illinois Online Network has a Self-Evaluation for Potential Online Students, as does Penn State’s World Campus, with its Online Readiness Assessment. This quiz is licensed under that Creative Commons Share Alike license allowing other institutions to use it as long as certain conditions are followed. It goes without saying, though I’ll emphasize the point anyway, that the onus lies with the student to take advantage of support and resources provided; educators and institutions do have a responsibility to support learning, but it’s the student’s responsibility to take charge and learn. Basic Web Skills: Students require a minimum set of skills to function within an online course that includes: how to email, browse the Internet, upload files, download needed plug-ins or software, etc. Yet some students won’t have one or more of the needed skills when beginning an online course. Below are suggested resources to fill in the skills gap. 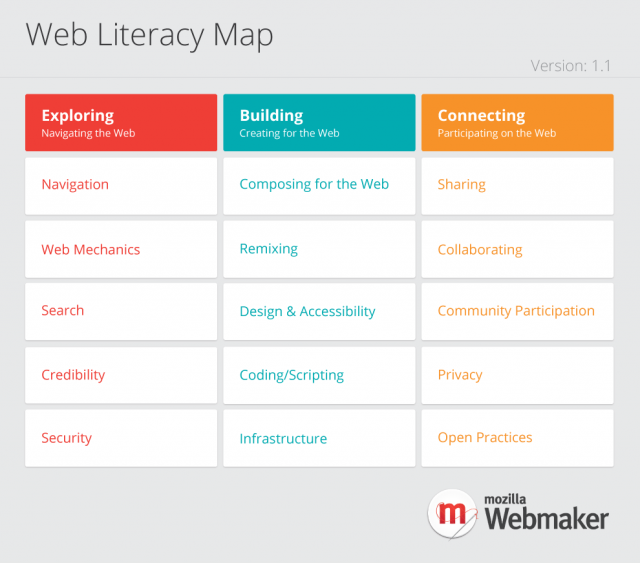 Image of Mozilla Foundation’s ‘Web Literacy Map’ developed by Doug Belshaw that outlines the skills and competencies people need to read, write and participate effectively on the web. Further details see resources section. How to Use Google Drive (formerly Google Docs): Knowing how to share documents, collaborate within virtual teams are other skills needed for students, and not just for learning online but for working and functioning within a digital culture. Overview of Google Drive: Video tutorials and basic instructions on the features of Google documents, sharing, storing and collaborating. How to Navigate within the LMS Platform: Each learning management platform has its own unique features, and though many are designed to be intuitive and user-friendly, some users require instruction in the form of video clips or text documents to develop confidence and proficiency. It’s helpful for the student that just-in-time-learning is provided by way of links within the course site to instructions specific to a task—for example: how to comment within a discussion forum, or how to upload an assignment file. Several institutions have created tutorials geared to the institution’s students. One example, New Jersey Institute of Technology created tutorials on how to use features of Moodle. I can see why some institutional educators create their own instructional videos for students, as unfortunately many help videos and text instructions offered by the LMS providers are geared to instructors, not students, per below. Desire2Learn: Desire2Learn Resource Center another example of the poor support options provided for students. I found nothing on this site that provides support for students, yet numerous help documents and resources for instructors. It’s no wonder that many institutions have created student help videos—all on the same topics, for example ‘how to post to a discussion forum’ see examples from Mansfield University, Montana State, San Jose State University, Clayton State University, (the list goes on) all which provide the same instructions. This is further evidence of the barriers students face when learning online; unless their institutions provides detailed support, some students face barriers to learning due to lack of support for navigating within the learning platform. Haiku: For Students: Using Haiku LMS: of all the platforms, this is the only one (I could find) featuring a section specific to students. OWL The Purdue Writing Lab: Purdue is the mother-of-all sources for writing help of any kind—from grammar help, to developing thesis statements, to report writing, citation help and more. The site features over 200 free resources , all of which are available to anyone. Guide to Grammar and Writing by Capital Community College Foundation. Very good site covering a breadth of topics to support various aspects of writing including essays, outlines and reports. Includes a section on grammar. Institution resources. 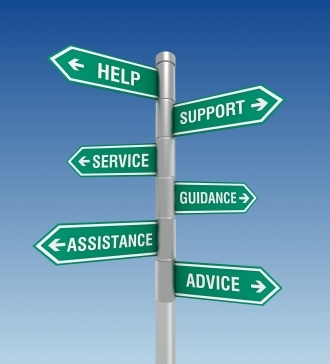 Many institutions offer writing help centers free of charge for students. Ideally, students studying in for-credit online classes should have access to similar support services online. If a writing center for online students is available at your institution, provide details on the course site, and/or post a note on message board with details for students. e-Tutoring.org is a collaborative online tutoring program and platform for writing skills that provides one-on-one, online support to students from numerous subscribing colleges within the US. It offers two models: collaborative and single. “Within the collaborative model, participating institutions share resources to provide greater coverage and quicker turn-around time. e-Tutoring monitors the quality of the tutor feedback. Within the individual model, an institution is free to use the software platform with their own tutors.” The platform appears to be a viable option for institutions with a large online student population. Click here to view the list of the participating schools. 2Owl: Grammar: These resources help students with grammar and the site includes a range of Grammar-related exercises. Index to Grammar terminology by Capital Community College Foundation. Kahn Academy: Khan academy is one of the most comprehensive web sites providing skill development in algebra, trig, calculus, statistics, chemistry, biology as well as subjects in history and language arts. Lessons begin at the elementary level, and continue to up to university-level topics and subjects. The site features hundreds of short videos on specific concepts within a subject that range from five to twenty minutes in length. Also offers practice exercises, and support forums. Institution support. As mentioned above some institutions offer virtual support in math for online students, if this is the case, provide details on the course site, and/or post a note on message board with details for students. HowtoStudy.com: A clean, clutter-free site dedicated only to study skill development, and though it’s geared to college students, any student may benefit from the concise and focused information provided. The site features twelve chapters, ranging from time management, to creating a study plan, note-taking, etc. My Study Life, a new [and free] app—an online student planner designed for students to plan and manage their learning time. It appears to have numerous features including tracking of due dates for assignments, schedule of classes and study times, notifications for scheduled tasks, due dates, and study times. There are numerous other sources on the Web students can turn to for help. The list above is but a very small representation of what’s available. However, often time is a barrier for students needing help; searching is time-consuming which is why institutions offering online courses [ideally] need to make help available, and easy to find to support learners that are still learning how to learn. Offering just-in-time help that is focused, and specific to a deficient skill can reduce barriers to learning, and lead to meaningful and successful education experiences. You have collected quite interesting resources, which are divided into 3 themes. I like this list. I would like to add a new very helpful site with a lot of great tools for students – https://www.contrib.com. What about the arts? Music. Both as study aids and well rounded education. A wonderful collection of resources – thanks for compiling this, Debbie – will definitely pass the link on to my students. And study skills are important for ALL students, but especially for students doing part-time and/or online courses. Thanks! So nice to hear from you again. Yes I agree with you on the study skills as important for all students, and even more so for students balancing jobs, family commitments etc. Very comprehensive listing of premium sites targeted to specific areas or needs. Thanks! Glad you found the list helpful.